With the second Hunger Games coming to UK cinemas in around three weeks time, I thought it would be a good time to do a quick comparison of the first film and one that seemed very familiar when I first heard about the film. That one being Battle Royale. It was a running theme over on my other blog when it hit the silver screen last year. 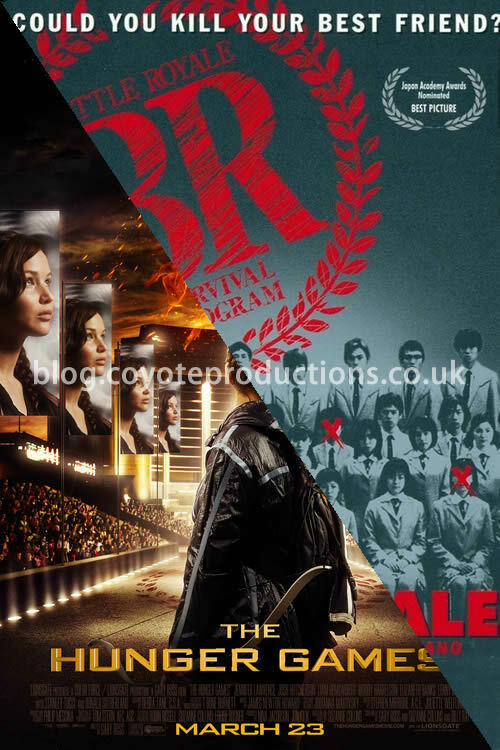 The author has stated that she wasn’t aware of the manga and film that was battle royal. Some people seem not to believe that. I do for at least one reason – she’s American and the film that sounds like it was Japanese and didn’t have that big of a release at us theaters. Both have the competitors that are under 18. The same number of boys and girls. One has a mass start whereas the other they are sent off at intervals. Nobody knows what weapons you are going to get at the start. Both have alliances formed that break up over time. Both game end with one winner. Both end with the competitors changing the rules so two “win”. Both are set after an apocalyptic event. Both are annual events that are televised. One allows the people watching to help their favourite competitor. Both have numbers for the competitors. In The Huger Games this is what area they are from. In battle royale the children each have a number.